Our on-going feature article of Mad Mark and his awesome US bound XB GT Coupe. Up coming feature! 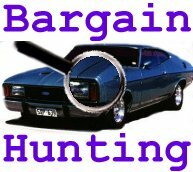 Do you know how to spot a bargain priced coupe? If not I can tell you what to look for. Designed and maintained by Brian Haines. Well it's a new look site for Australian Falcon Coupes for 2000, in my continual struggle to keep you up to date with what is happening with not only my own coupes but everyone elses, I thought it neccessary to update my site to a more user friendly design and do away with the sometimes confusing frames. 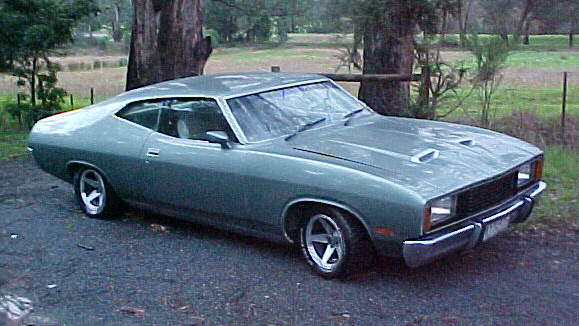 This internet site is dedicated to Falcon Coupes made in Australia from 1972 to 1979. I and many others agree that these are some of the best looking vehicles ever made. The falcon coupe line up includes the XA (1972- 1973), XB (1973-1976) and XC (1976-1979). There were also other ford coupes that will be discussed in this page including the limited edition XC cobra (1978) and XB John Goss (1975). An LTD version called a Landau was also introduced in 1973 but was dropped from the lineup in 1976 due to poor selling. Enjoy the site and don't forget to leave a message. My XC GS coupe is now Sold! 3rd October 2000 Now you will find Mat's XB GT coupe, Toby's Cobra and Michael's XB coupe all added to the Readers Coupes section. Updated the USA to go... section. 30th August 2000 Updated the USA to go... section. 8th August 2000 My XC GS coupe has now been sold. 19th July 2000 I am now selling my XC GS coupe. 20th May 2000 Added some more pictures of Michael Lagoutatzis' Landau. 10th May 2000 New feature article on Mad Mark's XB GT Coupe bound for the US of A. 14th April 2000 David Kemp's XB Coupe has now been added to Readers Coupes. 3rd March 2000 I went to the All Ford Day at Geelong a fortnight ago, if you like XY's and XW's then this was the day for you. However me being the XA-XC fan it turned out a little dissapointing, but never the less I saw some great looking coupes. Here are some new pics from the day. 1 new XA Coupe, 3 XB Coupes, 2 XC Coupes, 1 Cobra, 1 Bathurst Cobra, 3 Landau's. Updated the Newest Coupe section. 11th February 2000 More information added about Darren's XA GT Coupe. 6th February 2000 New Pictures: 2 XB coupe pictures, 1 new xa coupe picture, 1 Bathurst Cobra picture. Thanks to David Jaffray-Smith. Take a look at Darren's XA GT coupe in the Readers Coupes section. Please enjoy the site, but before you go, remember to sign the Guest Book. AUSTRALIAN FALCON COUPES © 2000 BRIAN HAINES. ALL RIGHTS RESERVED. ANY UNAUTHORISED DUPLICATION OF THE CONTENTS OF THIS INTERNET SITE WILL BE SUBJECT TO LEGAL ACTION.